Y o u r t i m e m a c h i n e a w a i t s .
E x p e r i e n c e t h e w o n d e r , t h e f r e e d o m , a n d t h e t r i u m p h o f o u r a n c e s t o r s i n E g y p t , a s w e t r a v e l b a c k i n t i m e w i t h a m i r a c l e - f i l l e d P e s a c h e x p e r i e n c e , f e a t u r i n g a n i n t e r a c t i v e 3 D style video, games and team challenges. 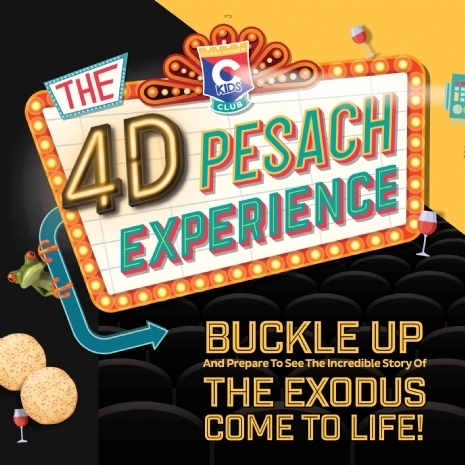 C h i l d r e n w i l l e n t e r t h e 4 D- P e s a c h E x p e r i e n c e t o learn about the story of Pesach and make it come alive. Get ready for a creative, fun-filled Day full of discovery and creativity. Our unique program has been designed by a highly qualified team of loving leaders. Every activity is carefully chosen to ensure each child receives the care and attention he/she deserves in an environment that guarantees a safe, friendly and fun-filled Jewish holiday experience. L'Chaim Chabad-Kingston & Moorabbin HC are also committed to ensuring the safety and protection of your child. All of our staff are required to have a valid Working With Children Check and complete a child protection course with Safeguarding Children Australia. For further information, please refer to our Policy Book, available at our office. In-house Kosher snacks and lunches are served. Thanks to a generous anonymous sponsor, it will only be $10/child or $18 for 2 siblings.